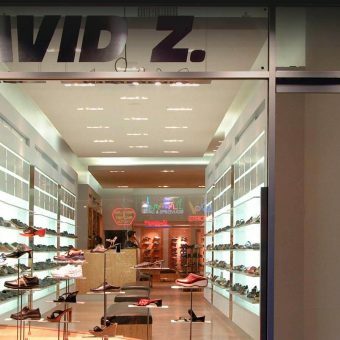 Long known for its urban discounter look, The David Z Shoe Company asked KOHN ARCHITECTURE to design its new store on 5th Avenue and 36th Street. The store showcases cutting edge design in an area of 5th Avenue known mostly for its `Going out of Business’ signs and souvenir shops. 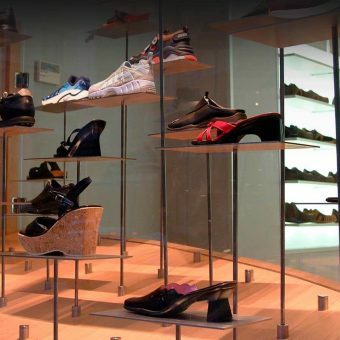 Kohn’s design takes the crass concept of the entire store window display of blasting fluorescent lights that electronic stores often used crowded electronic stores windows and cleverly re-adapts it inside the store. Two huge light boxes are divided into three groups with rows of pivoting aluminum panels that flank you as you walk in. 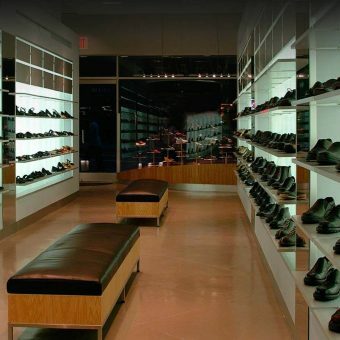 The glow of the lights is softened by the pivoting panels in front that turn into shelves used to display shoes. These wonderfully versatile shelves can be configured any number of ways, depending on how they are opened. They can be setup in a checkerboard pattern, some opened some closed. A wave-like pattern is possible, as well as stripes and abstract arrangements. Over 11,000 different configurations are possible. 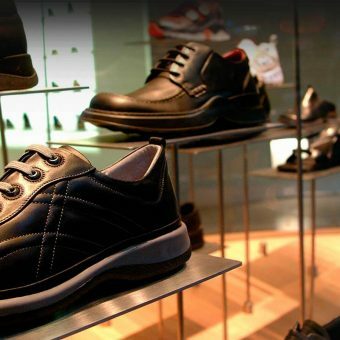 Best of all they provide order to the usual chaotic displays often associated with shoe stores. 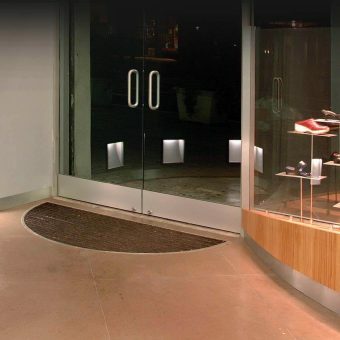 In the front window features a curved and gently sloping wood platform with adjustable stainless steel display stands to hold the shoes. The effect is a whimsical parade of shoes marching in cadence with the pedestrians and tourists on the street. Hovering above the special epoxy concrete floor is an ethereal floating ceiling plane. Stainless steel accents and simple wood benches and cash wrap add to the sense of calm and serenity that pervades the space. 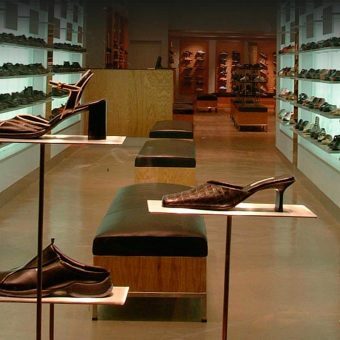 Lighting is one of the hallmarks of a Kohn project. Before becoming an architect, Mr. Kohn worked extensively in window and retail showroom display in New York and around the country. His innovative and surrealistic designs often featured wildly creative use of lighting and special effects.